I only came across the Gardens at Mount Usher in Ashford, Co Wicklow, for the first time last year. I had intended to go to lunch in Bray but ended up in Mount Usher by accident that Sunday afternoon and was overwhelmed by the beauty of the gardens during that first visit last July. Once again, at the end of October, I ended up in Mount Usher by accident for a second time, when I had planned instead to go for a walk on the beach at Brittas Bay. I had a busy morning this morning, the Second Sunday of Christmas, celebrating the Eucharist and preaching in Zion Parish Church, Rathgar, at 9 a.m. and once again at 10.30 a.m.
Two of us planned afterwards to have lunch in Greystones and a walk on the beach. But as we arrived in Greystones we thought it was a very cold and grey day, and decided to drive on further south. Once again, by accident rather than design, we ended up having lunch in the Avoca Café at Mount Usher. We got there before the Sunday lunch rush, and what a delightful lunch it was. One of us had Castletownbere Crab on Avoca toasted multi-seed with celeriac and apple remoulade, cucumber pickle, pink grapefruit and mixed leaves. I had homemade falafel with baba ghanoush, beetroot tzatziki, caramelised onion hummus, cous-cous and pita. We shared a jug of water and finished with two double espressos. Most people visit Mount Usher to see the trees and the foliage in Spring, Summer and Autumn. But the Winter views of the gardens, framed in the windows of the garden café were equally attractive. Co Wicklow boasts it is the “Garden of Ireland.” But Mount Usher also deserves its reputation one of Ireland’s loveliest gardens, and one of the prettiest too. There are over 5,000 species of plants and shrubs from all over the world scattered throughout the nine hectares of gardens along the River Vartry. 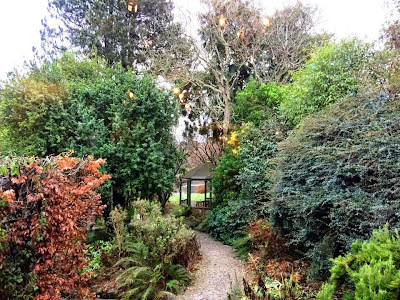 Mount Usher is one of the few Irish gardens ever to have had a whole programme devoted to it as part of the BBC’s long-running series, Gardener's World, and the BBC's Gardener's World Magazine once voted it the best garden to visit in Ireland. It is one of only three top-rated Irish gardens in the The Good Garden Guides, and the celebrity gardener Monty Don once nominated it as one of his favourite gardens anywhere.